A business trip to London. Lucy and I got the chance to see some art too. We spent the afternoon in the Tate Modern, after hearing much hype about the Ai Weiwei Sunflower installation in the Turbine Hall. 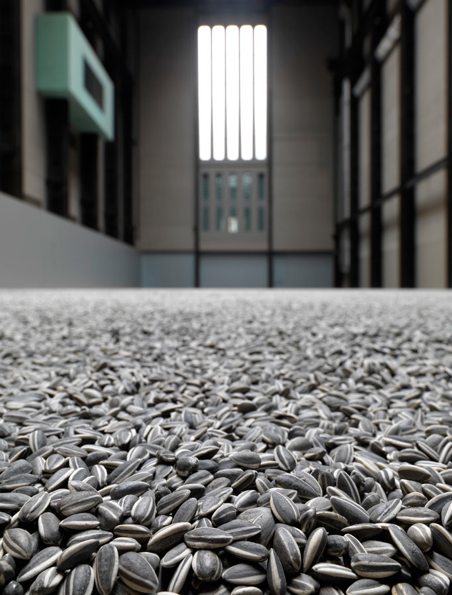 “Sunflower Seeds is made up of millions of small works, each apparently identical, but actually unique. However realistic they may seem, these life-sized sunflower seed husks are in fact intricately hand-crafted in porcelain. This artwork satisfied me – my love of repetition, of process. The muted colors of the landscape and the understated accumulation – what I love most is when a huge amount of time is spent on something, but that’s not realised – these look like real sunflowers, nothing special, but it’s within the process that I am impressed. The 15 minute film which accompanied the installation was more interesting to me than the completed piece.